We waited for the rush hour traffic to die down somewhat and then rode the 10 miles to the Steven F. Udvar-Hazy Center near Dulles Airport. That seems like a strange name for what should be called the Smithsonian National Air and Space Museum Annex, but when you donate $65 million dollars to its development, they name it after you. 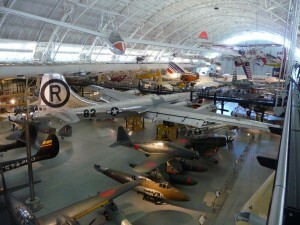 The facility downtown on the mall is stuffed to capacity, and the Smithsonian had many large pieces they could not display, hence the new facility. Dianna was a trouper but it wasn’t really her cup of tea, nonetheless we saw some very impressive things among the hundreds of aircraft and other displays. 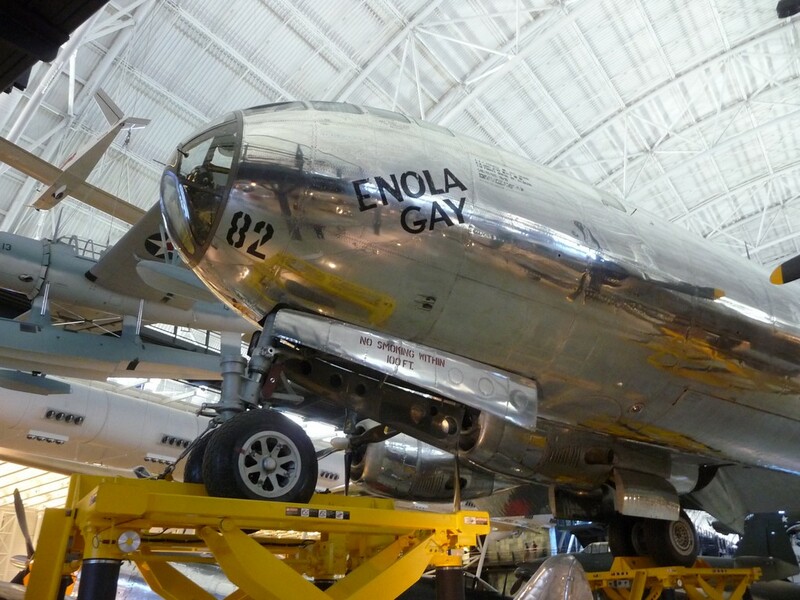 The highlights were the SR-71 that flew from Los Angeles to Washington in 1 hour and 4 minutes at an average speed of over 2,250 MPH, the Enola Gay B-29 bomber that dropped the atomic bomb on Hiroshima, a Concord, one of the first Boeing 707′s, and the Space Shuttle Discovery. 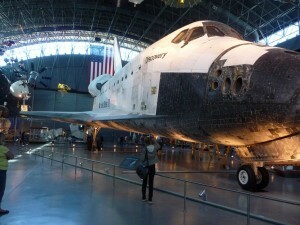 It was particularly interesting to see the shuttle close up. It’s much larger than I thought. After eating lunch at the McDonalds which serves as their cafe (no dollar menu), we rode down the interstate another 8 miles to the parking lot at the end of the Metro Orange Line. 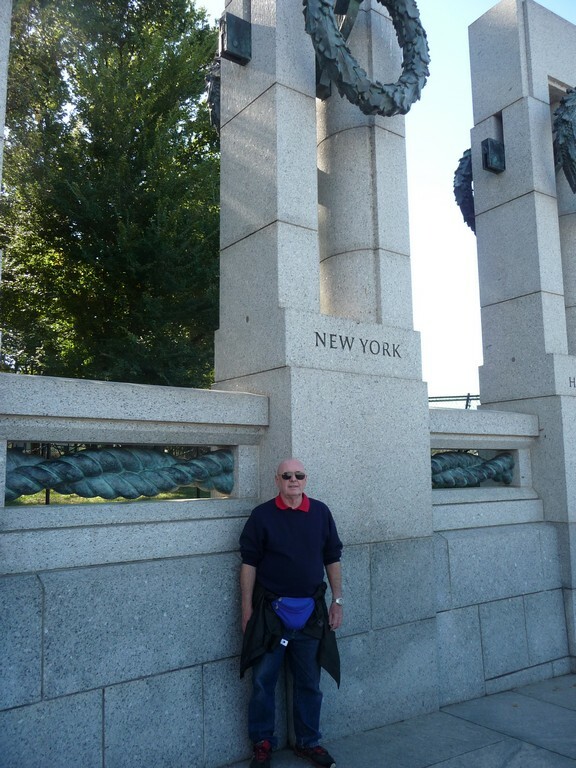 It was an easy subway ride into town where we exited at the Smithsonian stop near the Washington Monument. Dianna had wanted to visit the monument, but the damage from the earthquake in 2011 has still not been repaired. It is completely encased in scaffolding and you can’t get close. 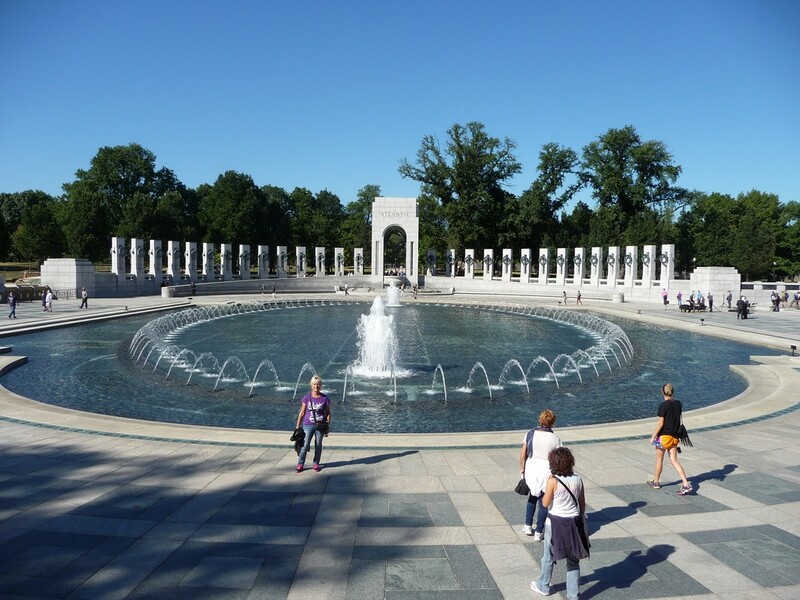 The first place we went was to the WW II memorial. It is located at the other end of the reflecting pool from the Lincoln Memorial and was built since the last time I was here. We both considered it as a way to honor our Dad’s who served. It is nicely done and we enjoyed it. We both spent some time thinking about our Dads. 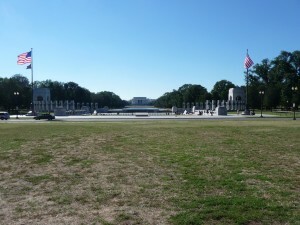 We then walked the length of the reflecting pool and made my usual pilgrimage to the Vietnam Memorial. Iam not moved as I was the first few times I went there, but it’s still something I feel I need to do. 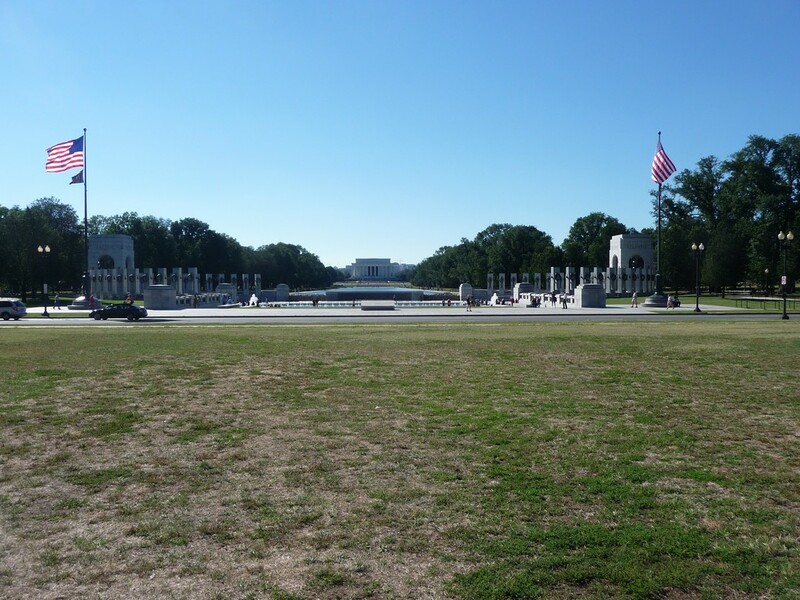 We then visited the Lincoln Memorial, which I always find moving, the Korean War Memorial which I’m not impressed with, and finally the Martin Luther King Memorial. I had not read much about the MLK Memorial, but it was nicely done. By then it was after six PM so we hoped we would miss most of the rush hour crush on the Metro. We didn’t. It was standing room only most of the way, but we were lucky and each found seats, just not together. Our feet and legs were tired from all the walking. DC is a big place and nothing is close. The scooter was waiting for us at the motorcycle parking area near the entrance to the station, and we found we didn’t even have to pay for parking with it. Another benefit of the two wheel world. The ride back to our hotel in Manassas was slow for a while, but finally the traffic broke up and we zipped along, stopping a mile or so from the hotel for pizza before the day ended. This morning we saddled up and hit the interstates. Rather than take the long, slow way back to Cleveland, we are doing it the quick way. We rode 300 miles today and will be home tomorrow afternoon with only about 260 to go. We rode the length of the Shenandoah Valley today, looking up to our left at the Blue Ridge where we rode just a couple days ago. The weather was clear to start but became cloudy as we rode south, and we hit rain just 20 miles or so from Wytheville, VA where we are spending the night. We’re in the same hotel, and the same room that we stayed in on day 3. The hot tub felt real good. This will likely be the final post on this adventure. Tomorrow it is more interstate down through Knoxville and on to Cleveland. This has been fun, even with the rain, and we’ve seen some beautiful scenery, interesting sights, and moving memorials. We plan to go see the shuttle that’s here as soon as it cools down. 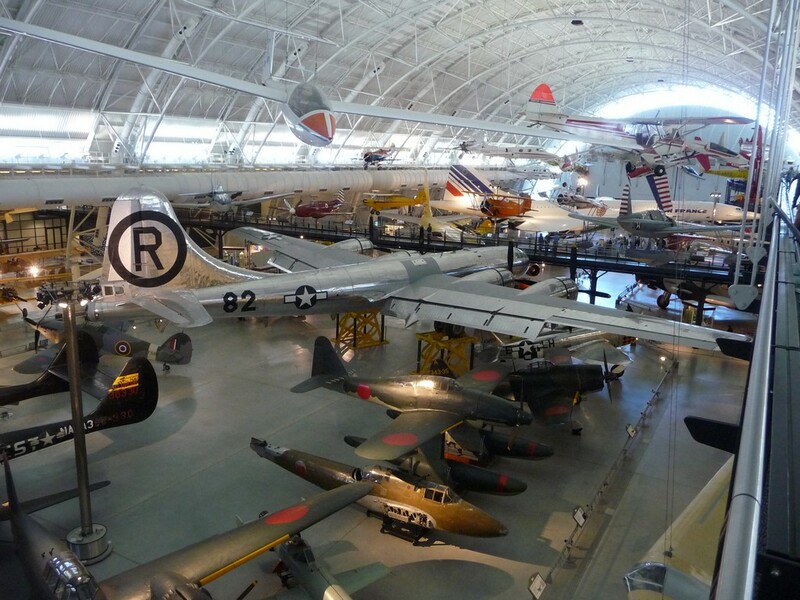 How did Steven F. Udvar-Hazy make his money? I don’t think I’ve ever heard his name before. 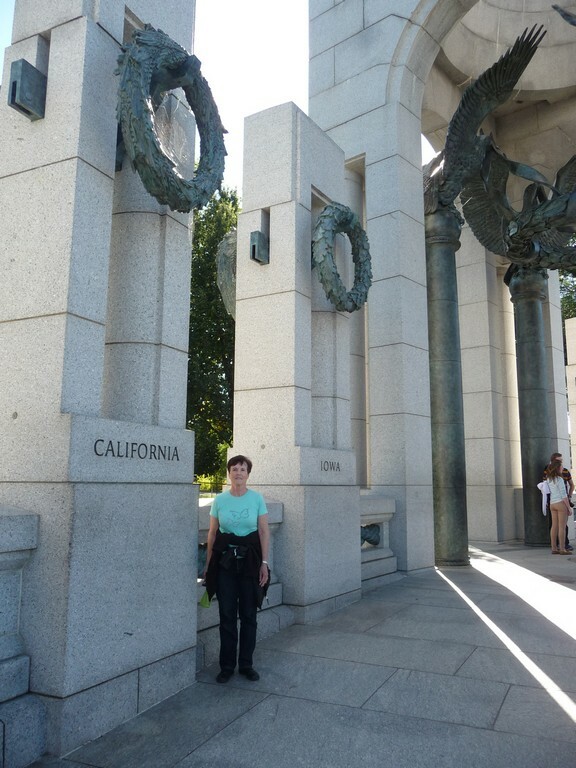 Wow, what a great visit into D.C. You saw all the memorials and a big museum, too! You are right about the size and scope of Washington, but it’s a fun day walking the mall. Looks like the weather cooperated the day you were there. A great ride and lots of fun and beautiful things to see along the way. Thanks for sharing. We arrived home at about 3:30 this afternoon. The trip totaled 1506 miles. This was by far the longest trip we have taken on 2 wheels. It was fun but it’s nice to be back in our own place again. We’ve never been to DC. There are lots of things there I want to see, but the Smithsonian is at the top of my list. Good thing you aren’t trying to see the DC sites this week.